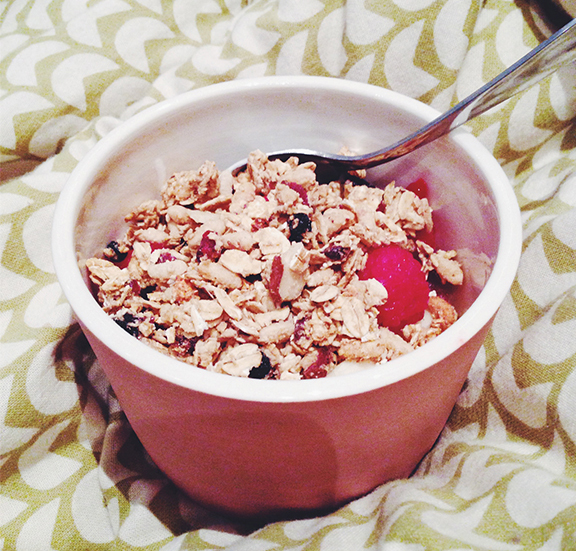 Early Morning Granola in my handmade artisan bowl, a great gift from a coworker and friend of mine. Some how last month I had my first experience bringing my laptop and actually working in a Starbucks. Can't believe I've never done that before- got a lot done! And with my favourite Tate Modern Souvenir notebook from when I went to London in 2010. Went to Igloofest for the first time since I've moved to Montreal! Mild night- no mittens needed for this dancing snowwoman! So much fun. Started working on a cottage country themed wedding suite for a friend! Reminded me of my love for graphic pen illustration. A favourite stationary store of mine, Nota Bene. Spent 30 min here trying to pick out my 2014 planner. So many colours and options for everything paper you could ever imagine. Tried Léché Desserts, a Montreal Donut shop. Little Valentines Day treat- the bright pink decor really fit with the day's celebration. My entrepreneurial minded brother, Jordan, started a project with 2 partners called Wise Words. I helped back their kickstarter project and received my product over the holidays! Trying to figure out how to feature these postcards in my place. These 6 are my favourite, the most inspirational quotes for me. Thinking of putting them on my wall. Attended the Telio's Canada's Breakthrough Designers Fashion Show this past week, which I designed the program book for! My day job as graphic designer and merchandising assistant for Telio is always fun and exciting this time of year! (Please ignore my badly manicured nails).